Chaos Invocation are a band from Germany that has been featured before in this zine and plays a very raw, atmospheric, melodic and satanic form of occult black metal and this is a review of their 2018 album "Reaping Season, Bloodshed Beyond" which will be released in March by W.T.C Productions. Ritualistic chanting starts off the album along with some clean playing, synths and bells and after the intro the music goes into a very fast and raw musical direction which also uses a great amount of tremolo picking and blast beats while the vocals are mostly angry black metal screams. When guitar solos and leads are utilized they are done in a very melodic fashion while the songs also bring in a great mixture of slow, mid paced and fast parts along with the vocals also using a melodic and clean style at times, some tracks also bring in a small amount of acoustic guitars. The ritualistic elements also making a return in certain sections of the recording as the album progresses while all of the musical instruments also have a very powerful sound to them and some of the tracks are long and epic in length along with some atmospheric synths being added into the music briefly and when growls are utilized they are done in more of a demonic fashion and towards the end a small amount of spoken word samples can also be heard. 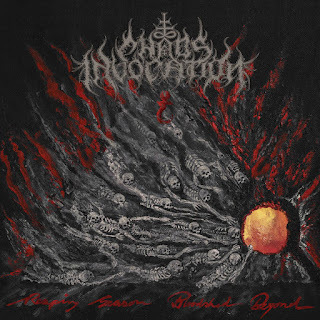 Chaos Invocation creates another recording that remains true to their style of occult black metal while also showing a great amount of progress as musicians, the production sounds very professional while the lyrics cover Satanism, Luciferian, Occultism and Left Hand Path themes. In my opinion this is another great sounding recording from Chaos Invocation and if you are a fan of occult black metal, you should check out this album. RECOMMENDED TRACKS INCLUDE "Calling From Dudail" "The Search Of Keys And Gates" "Luciferian Terror Chorale" and "Ajna Assassins Absolute". 8/5 out of 10.